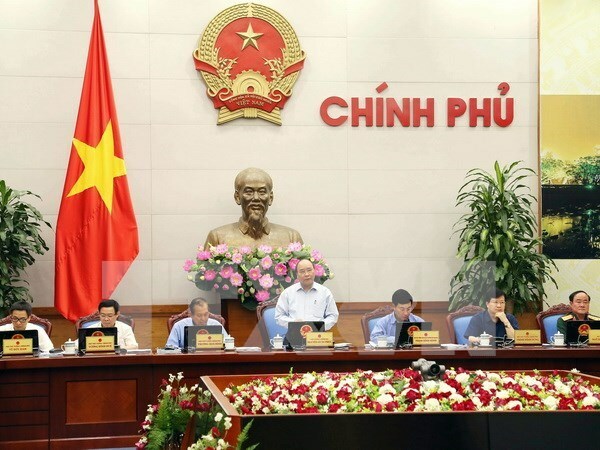 Hanoi (VNA) – The Government held a symposium in Hanoi on April 11 to collect feedbacks on a draft law on credit institution restructuring and bad debt settlement as well as plans on amending laws related to the Law on Planning. According to a report of the State Bank of Vietnam, after four years of implementing a project to restructure credit institutions, ineffective credit institutions were identified and restructured, avoiding bankruptcy and out of control. Participants stressed the need to issue a separate law to deal with difficulties in the process of restructuring ineffective credit institutions and solving bad debts. Chairing the meeting, Prime Minister Nguyen Xuan Phuc said it is necessary to finalise regulations on restructuring credit institutions and resolving bad debts, stressing that if the work is not accelerated, it will cause impacts on the country’s socio-economic development. He agreed to map out a draft resolution of the National Assembly on resolving bad debts, and a draft law on amendments and supplements to a number of articles of the Law on Credit Institutions to submit to the NA for consideration. The PM noted that the amendments and supplements to laws related to the Law on Planning must be conducted in line with the current regulations.